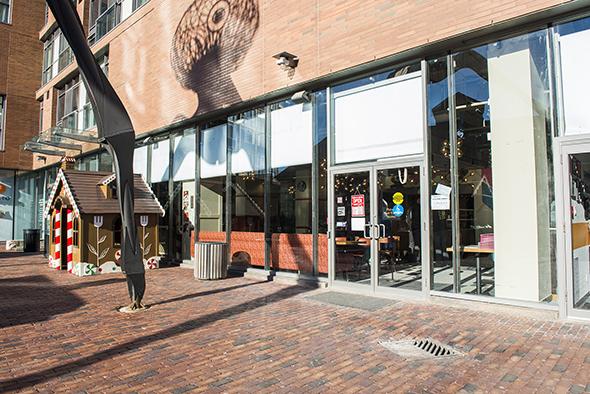 Cacao 70 is heaven for chocolate lovers. 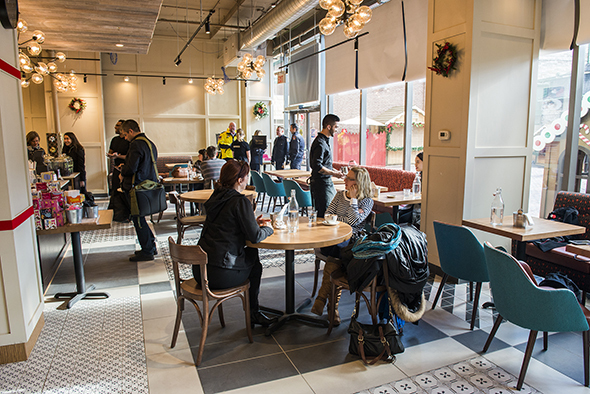 The Montreal chain's first Toronto location is situated in the heart of the Distillery District and it's dedicated to serving up decadent desserts and multiple types of hot cocoa. The brightly-lit space seats 30 and as I walk in, I notice giant jars filled with dark, milk and white chocolate. Floor manager Andrew Willcock tells me they're used to make hot chocolate and to decorate desserts. 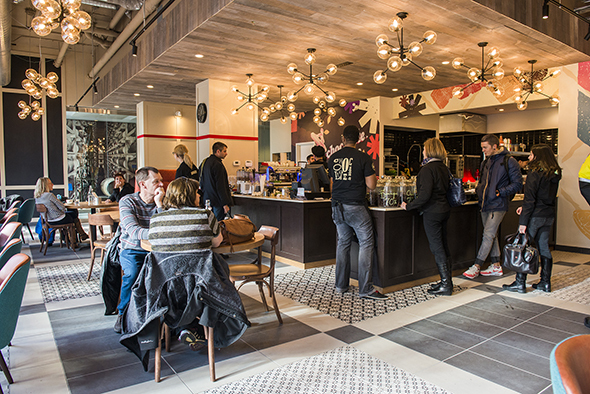 I peruse the menu and immediately start salivating over delicious-sounding options such as the chocolate peanut butter pizza ($13.95 to $29.95) and triple chocolate fondue ($11.25 to $17.25). There are also savoury brunch options available, including cheesy pressed crepe sandwiches ($14.25) and various egg dishes. The all-stars, however, are the desserts. First up, I try a strawberry and cheesecake crepe ($15.75). 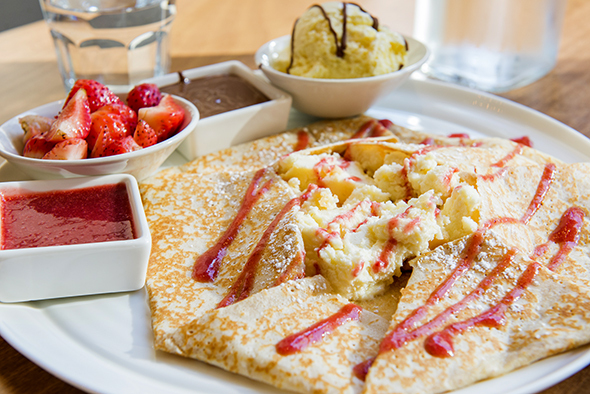 The thin, but massive, French-style crepe pairs perfectly with chunks of plain cheesecake, berry sauce, melted milk chocolate and vanilla ice cream. The choco-nut waffle ($15.50) arrives next. Willcock tells me it's one of the most popular dishes; he estimates that he serves one to every second table. And, after tasting this cornucopia of candied hazelnuts, chocolate, toffee bananas and vanilla ice cream, it's easy to see why. 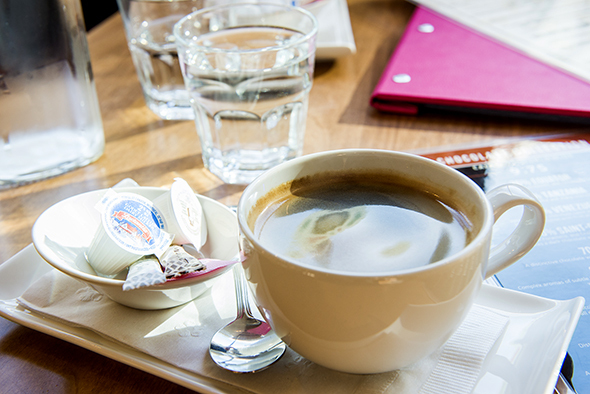 To wash it down, I order an Americano ($2.25), which thankfully cuts through some of the richness before I dip into Cacao 70's drinking chocolate ($9.75). 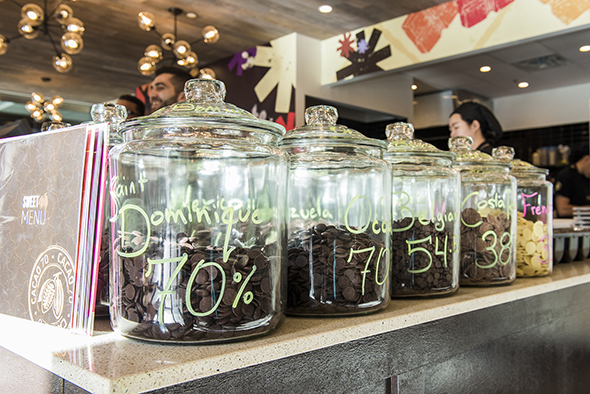 With 15 options available (white, milk, semi-sweet and dark), Willcock recommends choosing one that's more than 70 percent cocoa. "We're trying to promote chocolate as something that's not just a Mars Bar," he says. Some studies say that chocolate with at least 70 percent cocoa solids may be healthy for you. I get the 76 percent Ecuador variety (because I'm a hard-core healthy eater). 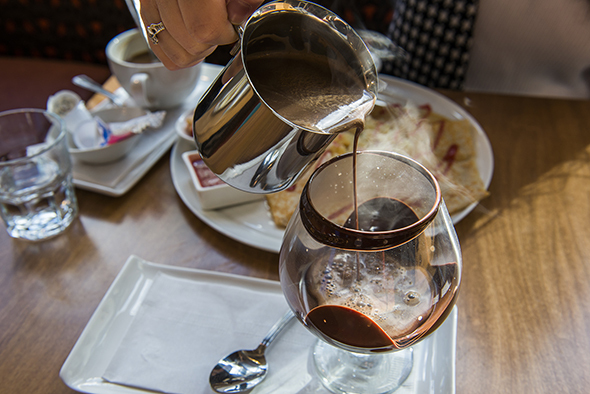 Melted pieces of chocolate arrive in a brandy glass alongside a metal cup filled with a dark chocolate liquid base. Willcocks tells me it's a blend of dark chocolate, milk and cream. Vegans and the dairy-averse will be happy to note that it can also be made with soy milk. I slowly pour the base over the melted chocolate until it becomes perfectly viscous. It's like drinking a chocolate bar. 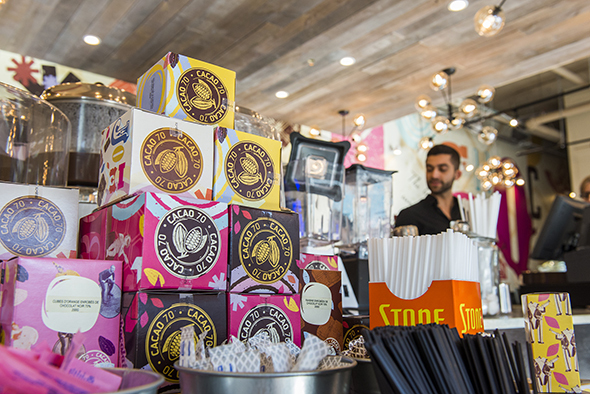 And of you're able to stomach more chocolate after a visit, Cacao 70 sells small boxes of chocolate-covered goodies like coffee beans and blueberries ($9.95 each). It's currently open until 11 p.m. from Sunday through Thursday and until midnight on Friday and Saturday nights.